The Greenwood Cycle Trail at Marston MoretaineCycle RouteThis scenic trail allows you to enjoy a leisurely cycle ride that is suitable for all standards of cyclists. Following this trail takes you out and about the villages and hamlets of North Bedfordshire. 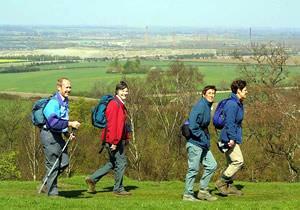 Suggested Start / Finish point: Marston Vale Forest Centre Start Nat GR: TL004416. This scenic trail allows you to enjoy a leisurely cycle ride that is suitable for all standards of cyclists. Following this trail takes you out and about the villages and hamlets of North Bedfordshire. How to get there by car/Parking: The Forest Centre is well signposted just off the A421 at Marston Moretaine and only 5 minutes from J13 off the M1. From the M1 Motorway head towards Bedford and turn right at the first roundabout. A quick left-and-right, and you'll find us down on the left. Parking is available at the Forest Centre. The Car Park is free and open to the public from 10am - 4pm in winter or until 6pm in summer.